Here are a few Kohlrabi recipes that are simple and easy to make. 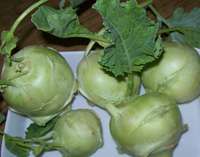 Kohlrabi is called navalkol(Marathi), NaviluKosu (kannada) and knolkohl. It is a turnip like vegetable and belongs to cabbage family. Ready to serve Kohlrabi Subji - Navalkol bhaji in the image above. Kohlrabi is cooked by itself or with lentils. It is a good accompaniment with chapati or with steamed rice. This recipe of kohlrabi does not use many spices. You need to remove the skin of Kohlrabi and use only the inner fleshy part. You can also use the leaves if they are tender. If you wish, you can use your favorite spice powder, or a different masala powder for this subji so that you can get different taste each time. Use garam masala or coriander and cumin seed powder or only red chili powder. I am using only red chili powder in the recipe below. It tastes great. Add mustard and cumin seed. When they stop spluttering, add Asafoetida (hing)and turmeric powder. Add chopped kohlrabi, soaked Bengal gram dal. Mix and Cover. Cook for 5 minutes. Add chili powder, curry leaves, salt, sugar. Stir and continue cooking. Add a little water if necessary. Cover and cook on low flame till kohlrabi is done. To check if kohlrabi is done, press a piece with a metal spoon or blunt knife. If it pierces easily, your kohlrabi is cooked. Add coconut and chopped Coriander leaves(cilantro). To reduce final cooking time, you can steam chopped kohlrabi for 10 minutes before adding to seasoning. Or you may pressure cook navalkol after chopping. It will take about same time as plain rice. So you may cook it in a pressure cooker in a separator along with plain rice. Add the chana dal in the seperator along with navalkol pieces. After the cooker cools down, make the tempering as shown in step 1 and 2 and then add the cooked navalkol. Add all the other ingredients and cook for 3-4 minutes. For another kohlrabi recipe go to Kohlrabi and Lentil Curry - Knolkol and Masoor(Red Lentil) Curry.